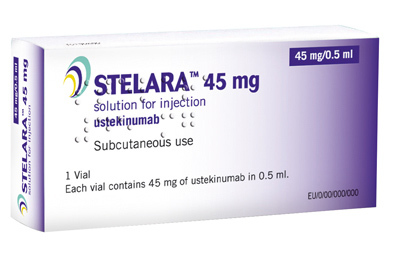 Stelara (ustekinumab) is an injectable biologic product indicated to treat adults who have a moderate to severe form of psoriasis. Stelara has also been approved to treat psoriatic arthritis and Crohn’s disease. The medication was developed by Janssen Biotech, Inc., which has exclusive marketing rights to Stelara in the U.S. The Janssen Pharmaceutical Companies hold exclusive worldwide marketing rights to the drug. The U.S. Food & Drug Administration (FDA) initially approved Stelara in 2009 to treat a moderate to severe form of psoriasis called plaque psoriasis. About 6 million people in the U.S. have plaque psoriasis, which is characterized by thickened patches of inflamed, red skin, often covered with silvery scales. The disorder can cause significant physical discomfort from pain and itching, as well as psychological distress for people who are self-conscious about their appearance. In September 2013, the FDA approved Stelara to treat active psoriatic arthritis in adults, either alone or in combination with methotrexate. Psoriatic arthritis is a chronic immune-mediated inflammatory disease characterized by both joint inflammation and psoriasis-associated skin lesions. The disorder affects up to 37 million people worldwide. In September 2016, Stelara’s approved uses were expanded once again to include the treatment of moderately to severely active Crohn’s disease in adults who have failed or were intolerant to treatment with immunomodulators or corticosteroids but never failed treatment with a tumor necrosis factor (TNF) blocker, or who failed or were intolerant to treatment with one or more TNF blockers. Stelara can interact with live vaccines, such as the flu or polio vaccine. The medication should only be used by pregnant women if absolutely necessary, and should be used with caution by women who are breastfeeding. Patients treated with Stelara should seek immediate medical attention if they experience signs of an allergic reaction including hives; difficult breathing; or swelling of the face, lips, tongue, or throat. Immunosuppressant drugs typically increase the risk of cancer. In January 2013, the “Warnings and Precautions” section of the Stelara label was updated to note post-marketing reports regarding the rapid appearance of multiple cutaneous squamous cell carcinomas in patient who had pre-existing risk factors for developing non-melanoma skin cancer. In May of that year, the label’s “Adverse Reactions” section was modified to include information about malignancies reported among psoriasis patients who had participated in clinical trials for Stelara. In April 2016, an analysis of the FDA adverse events database conducted by the Institute for Safe Medication Practices suggested that the rate of cancer among patients using Stelara was 15 times higher than those taking another psoriasis treatment called Otezla, which does not have an immunosuppressant effect. By contrast, patients using TNF blockers like Enbrel, Remicade and Humira, were only five times more likely to develop cancer compared to Otezla users.